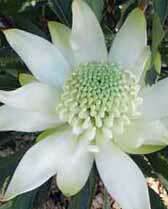 Navigate these pages to see a selection of waratahs available for order. Brought to prominence by Thistle Stead (Harris) and cultivated in The Wirrimbirra Sanctuary and originally found in the Kangaloon Area. This large creamy white flower with long bracts is in demand for floral arrangements etc., unfortunately the tendency to burn and turn brown contrasts with the white flower. Leaves are long and narrow and coloured light green.